“Blue and white, let’s fight Blues fight,” echoes from the sidelines as we, the University of Toronto Pom Team, cheer on the home team. As excitement builds from minute to minute and point after point, our jobs grow in importance. 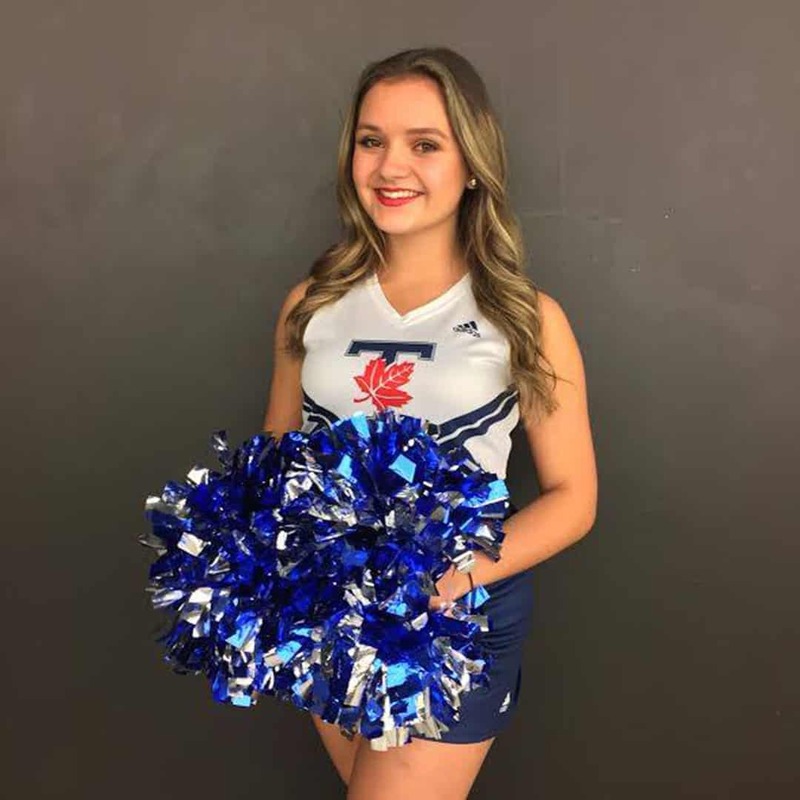 The pom team consists of dancers and cheerleaders who perform sideline routines and cheer on and support Varsity Blues teams during each football, basketball, and volleyball season. We bring talent and spirit to the stadium and court to motivate the crowd. While we cheer on the teams, the audience provides us with motivation; feeding off their excitement and energy is what truly makes it possible for us to perform and be at our best. The hype begins at practice and continues during the countdown leading up to game day. Many of us started out as dancers, but once given pompoms, you never want to put them down. Why do I do what I do? Being a cheerleader puts me in a competitive atmosphere that demands peak performance and perfect execution. I was that girl who, upon recovering from a dance injury, wanted to get right back to dancing and performing. We train to be our best and attempt to prove that there isn’t a circumstance that can stop our passion. Being a part of the pom team is important for me personally — it’s the way I de-stress and do what I love a few nights a week. Representing U of T is a privilege for all Varsity athletes. Not only are we representing ourselves, we are representing our teammates and the university as a whole. We become part of the game, and like a player seeking out a victory, we are fully involved, play after play. Beyond home games, the pom team attends many special events. Each year we share our talents at the Santa Claus parade and Scotiabank Marathon, and many of us are also involved with charity work and volunteering. Our strong team bond makes it possible for us to trust one another and help each other improve on our weaknesses. Waiting for progress at times may seem stressful, but with the proper mindset, we are all capable of achieving our goals. The stress of practice results in ups, downs, and pressure to not only remember all your routines, but to keep your friends and social life together. Like all Varsity athletes, as a cheerleader, you cannot let outside factors affect your academics, game, or performance. Early morning classes can be difficult when you’ve just had a late night practice. And it’s tough having to manage five to six courses a semester while maintaining a decent GPA and attending practice regularly. Many disregard just how much time, effort, training, and creativity goes into our final product. While there are many stereotypes surrounding cheerleaders, there is more to each person behind the pom-poms. As a commitment that goes up to 10 hours per week, the life of a cheerleader is just as serious as a member of any other Blues sports team. All the work is done behind the scenes, and the end result is put on display. Practices are mandatory to establish routines and cheer: they ensure everyone is in sync and that the performance is ready for game day. There is a lot of hype surrounding the lead-up to game day. There is no better feeling for a cheerleader than having a full stadium of fans filled with energy. From the staff to the players, excitement is written on everyone’s face. As cheerleaders, we must arrive before the scheduled game time for our pre-game preparation, which consists of a warm-up, going over our routines, welcoming fans, and encouraging each other to perform. Previous pom teams at U of T choreographed a fight song routine to the traditional “Blue and White” song composed in 1908. In honour of keeping the culture and our university’s history, the pom team performs this dance each time the Varsity Blues football team scores a touchdown. Another important ritual is our cheer after a practice, but especially after a game. No matter the outcome — win or loss — the game is fought together. The team will huddle up in a circle, put their poms in the centre and cheer our team motto. This is the last thing we do as a team to show unity and support for one another. Whether you are a fan, a player on the team, or have pompoms or not, when the final play is made and the last whistle blows, you become part of the home team.